← Praline Pumpkin Pie to die for. Really. THE SPY LOVER by Kiana Davenport is a magnificent novel about the human heart and the savagery of the Civil War, about conflicting loyalties, about love and redemption, about people pushed aside because of their skin color and the slant of their eyes. It is told through the story of three main characters caught up in the Civil War: a Chinese immigrant who fights against slavery and for the Union; his daughter, Era, who tends the wounded of the South while spying for the North; and the Confederate cavalryman she nurses, then loves, and finally betrays. What is surprising is that no one up until now has written about the Chinese who fought valiantly for a country that offered them citizenship, but then reneged on that promise due to powerful anti-Asian sentiment afterwards. Davenport fills that gap with this brilliant portrayal of that war. The day-to-day lives of the soldiers, North and South; the hands-on participation of Southern women in the war effort; the epic battles; the prejudice against the Chinese before and after the war are all so thoroughly researched you know you are reading a work from the hands of a master. We learn how Southern women cultivated poppy for opium to give their soldiers–not only for pain, but as a kind of euphoric courage as they went into battle without enough resources, food in their bellies, or even, shoes on their feet. In the mind of the Southern hero, Warren Petticomb, she captures what had to be the dreary and exhausted mind set of soldiers who knew they were fighting a losing war. Though I am a Northerner by birth and bent, the reader cannot help be sympathetic to the individual suffering of both sides, the inestimable cost in human misery. 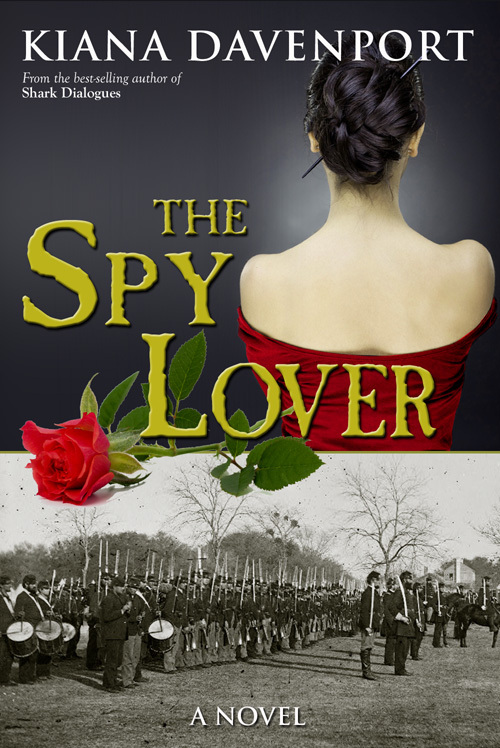 THE SPY LOVER brings to life the blood and guts of the Civil War in a vivid, unforgettable way. A few decades ago, high praise for her writing would have been: she writes like a man, because the Civil War was bloody awful and Davenport does not shy away from depicting it as such, blood, guts and gore. The first chapter plunges you right into that reality, and those who would turn away should read on. There is so much to admire here. Of the end of day at Gettysburg, she writes: “…Eventually, the guns die down, exhausted. Union artillery continues ripping at their flanks, as barefoot and starving, Southern boys fall apart in human bits and pieces until the last of them go down. Dusk approaches, the battle blurs, the air turns soft and still.” I gave up reading it at night because I couldn’t get to sleep after. Yet at its heart, this is a love story. Davenport herself is an amalgam of the two cultures she writes about so movingly. Her mother was a full-blooded Hawaiian native, her father an Anglo from Alabama. The two met when he was in the Navy and stationed in Pearl Harbor. As she puts it at her own blog: “I am part-native, part-Southern redneck.” From her mother’s side, an uncle was the basis for the character Johnny Tom, the Chinese Union fighter; from her father’s side, an ancestor who was a cavalryman with the famous unit known as the Prattville Dragoons of Alabama. Davenport has written well-regarded novels before, but this is her masterpiece and catapults her into a whole new category. I wish it had a different title so it didn’t sound like merely a romance novel, but by any name, THE SPY LOVER-historical novel, expose, love story–is destined to become one of the classic novels about the Civil War. Published by Thomas & Mercer, a division of Amazon. Order in paperback or Kindle version–please!–at First Mother Forum in the sidebar. I can’t figure out how to ad the direct link to Amazon here. Maddening. And thanks. This entry was posted in Books I Love. Bookmark the permalink. I finished the book a few days ago and hated for it to end. Since then, I have spent lots of time googling some of the events mentioned in the above review that I did not know. This is the best kind of book – a real page-turner but you can’t turn too quickly because you want to savor the words. She writes so beautifully. This would make a most excellent movie! !